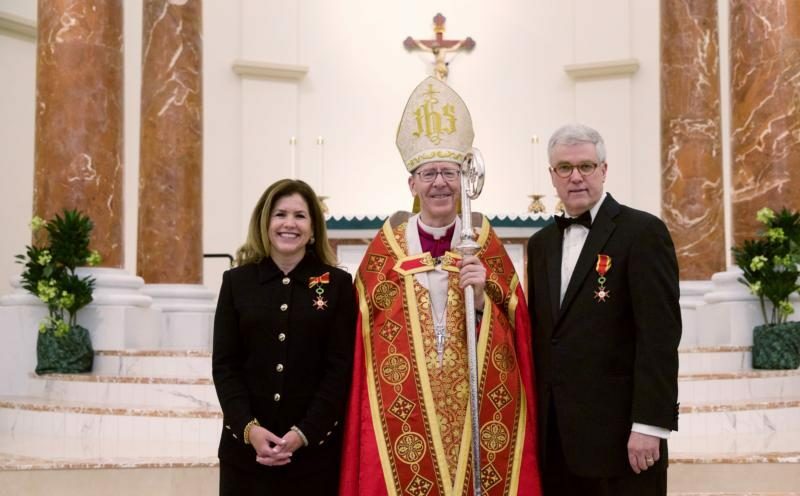 SCOTTSDALE, Ariz. (CNS) — An Arizona couple who have spent nearly three decades defending religious freedom in the United States and around the world are new members of the Equestrian Order of St. Gregory the Great. Alan and Paula Sears were honored for their work with Alliance Defending Freedom during vespers June 29 at St. Bernadette Church in suburban Phoenix. Bishop Thomas J. Olmsted of Phoenix presided over the ceremony. Investiture in the order is the highest honor the church bestows on laypeople and is given in recognition of extraordinary service to the Vatican. The Sears were honored as a couple. Alan Sears, an attorney, is the founder and former president and general counsel of the alliance, which works on issues of religious freedom, the sanctity of human life and marriage and family. He led the organization as CEO from its founding in1994 until January. He continues to work for the organization. Paula Sears has been at her husband’s side for 28 years. Both have traveled with their now four grown children on behalf of the organization. They are also one of St. Bernadette Parish’s founding couples. The Scottsdale-based alliance has scored 49 victories at the U.S. Supreme Court, trained thousands of attorneys and law students and defended religious liberty, life and marriage worldwide since it was founded with $4,700 in start-up funds. The organization also has offices in Washington, Atlanta, New York, Mexico City and several European cities. The investiture occurred in a packed church on the feast of Sts. Peter and Paul. Father Frederick Adamson, diocesan vicar general, presented the couple to Bishop Olmsted for investiture, pointing to the couple’s living out of their vocation in their home, parish and the public square. Bishop Olmsted’s homily highlighted the courageous example of Sts. Peter and Paul, who both gave their lives as martyrs. “They’re honored together, a recognition of how God works in twos,” the bishop said. Hand in hand, the couple approached the altar. Bishop Olmsted asked them if they were willing to maintain “unswerving fidelity” to God and the pope, to which they responded in unison, “I do.” He read the English translation of the proclamation of the church signed by Cardinal Pietro Parolin, Vatican secretary of state. The bishop blessed the insignia of the order and sprinkled it with holy water. He turned to the Searses and declared, “In the name of Holy Father Francis, I hereby invest you with the insignia of a Knight of St. Gregory the Great. He pinned the eight-pointed cross on Alan’s jacket, then turned and pronounced Paula a dame of St. Gregory the Great before pinning on her insignia. The couple received a standing ovation from the congregation. The Searses joined the company of fellow members of the order G.K. Chesterton, Eunice Kennedy Shriver and Bob Hope. Pope Gregory XVI established the order in 1831. “When we were being asked to consider leading ADF, none of us knew what it would really fully require,” he said. “Every child and every spouse that gets caught up in ministry stuff, they don’t ask for it,” he added. Sears’ alliance work takes him out of town about 200 days a year. “In many ways,” Alan Sears said, “she was a single mom.” As soon as the school year ended, the entire family traveled together. For 14 years, every summer was spent moving from city to city and hotel to hotel, Paula Sears taking the kids to a park or mall while Alan Sears worked. Paula Sears, for her part, credits her husband. That may explain the trepidation Paula Sears felt when she received a call from Maria Chavira, diocesan chancellor, asking the couple to visit diocesan headquarters without revealing the reason why. “We got worried,” Alan Sears said. “We actually went down and parked at the diocese half an hour early and went to St. Mary’s Basilica to pray and ask God to prepare our hearts for the meeting. We walked into the conference room, and there’s our daughter with Father Fred Adamson, Dr. Maria Chavira, and a couple of our colleagues,” Paula Sears recalled. Bishop Olmsted handed them the letter explaining that Pope Francis had made the award. Coronel writes for The Catholic Sun, newspaper of the Diocese of Phoenix.